Hand crafted one of a kind pen with true bolt action mechanism. 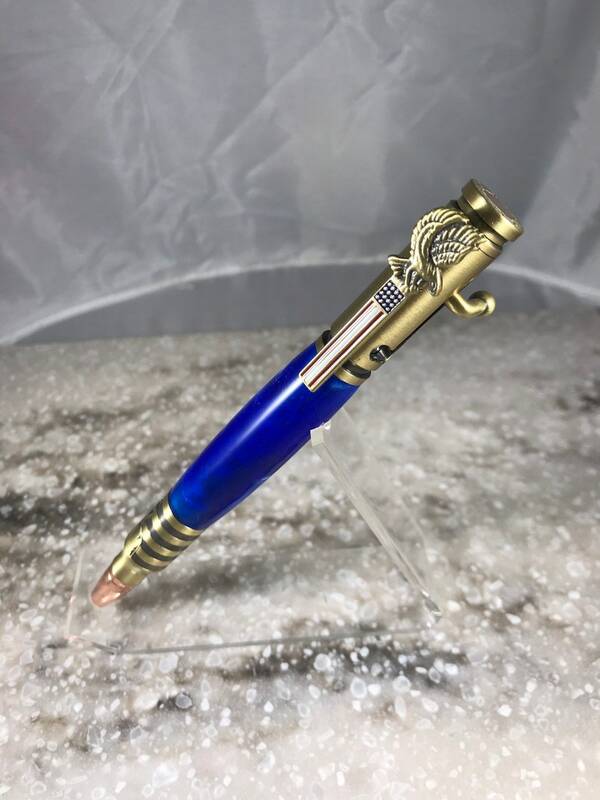 This patriotic themed pen features a cast Bald Eagle emblem with a red, white and blue American flag clip. Salute the troops is engraved on the pen cap to honor the American Troops. On the pen tip there is a American Flag and a saluting serviceman. Finished in antique brass and blue acrylic body. Color of ink is black and uses a standard Parker refill. Total pen length is approx. 5 inches. Includes slide out gift box for easy gifting. Stock #21. NH Made store has no sales tax.